Blietz: Helianthus. Photo courtesy of the Museum of Wisconsin Art. To many, there is no sight as cozily pastoral and quintessentially Wisconsin as cows grazing on a farm, and no tastier snack than a squeaky bag of freshly-made cheese curds. 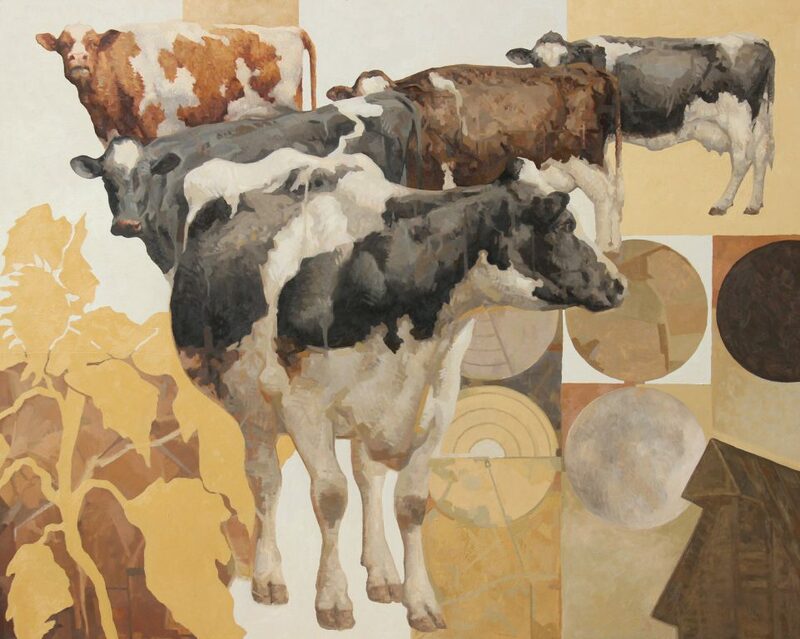 Which brings us to Door County artist Craig Blietz, who has chosen the beloved bovine as the focus for his latest exhibit, “Herd,” on display now through January 13, 2019 at West Bend’s Museum of Wisconsin Art (the works are on loan from Milwaukee’s Tory Folliard Gallery). “Herd” consists of 23 pieces, including eight smaller mixed-media works, that pay tribute to the cow, on its own and as part of the agricultural landscape. Besides being good companions, cows are providers of milk, beef, cheese and leather. In Hindu culture, the cow is revered among the religion’s practitioners, who are vegetarians, and although many Wisconsinites don’t hold the same beliefs, the animal is undeniably important as a food source and to the state’s economy. Pastoral life and cows have been themes in art for centuries. Blietz is not an abstract painter but he does stray from the traditional. The artist uses an array of artistic mediums on different surfaces (oil, pen and ink, charcoal and graphite, and pencil on linen, panel, and casein) and employs a neutral palate (an array of rusty reds, grays, blacks, whites, creams, maize and butterscotch). All but two of the exhibit’s walls are painted an off-white, with two accent walls tan and butterscotch. Each photo is held in a white lacquer frame, so as not to detract from the work itself. The effect is muted, but anything but dull. Reid adds that the artist is organized, methodical and professional. “He’s just phenomenal to work with,” said Reid. Blietz’s work is possibly inspired in part by Illinois-born artist Schomer Lichtner(1905-2006), for whom Holstein cows were a muse. Blietz doesn’t mirror Lichtner’s whimsy and fondness for bright colors, but captures the cow’s essence. “Artists I admire seem to represent a strong sense of place,” says Blietz. Blietz, who has a background in figure painting, pays careful attention to the cows’ anatomy. Nearly every muscle is defined, giving each a sculpted appearance. To the artist, every cow, like every human, has its own personality. Some are outgoing and confident; some are reserved and shy. Some stand apart from the herd. Cows are painted in profile and from the front. Although not immediately obvious to the observer, each animal looks different, upon careful examination. The artist incorporates many neutral hues in the cows’ sleek-looking coats. Blietz seems to take a mathematical approach with his work, which is evident in a painting with a grid on top of it, illustrating how the artist scales his drawing. He also seems to have a science bent. Many of Blietz’s paintings are Latin-named: “Helianthus” (Sunflower), “Lupulus” (Hops), “Linum” (Flax), and “Quadrupedibus” (Cranberries). Some of Blietz’s paintings give the cow center stage, but others place the animal amidst a larger backdrop of wheat, hops, windmills, and other agricultural symbols. In these, the cow plays an important role on the farm, but does not dominate; it’s simply part of the industry. Cows are placid creatures, with warm dark eyes and noses just begging to be petted, they are also commanding and majestic, qualities that shine through in Blietz’s paintings. In “Parcel,” (62” x 58”, ink, casein, charcoal and graphite) saliva drips from a fearsome-looking bull’s mouth while he intensely stares ahead. He’s not one to tangle with. “My work is motivated by my desire to share my sensations and observations of living and creating in rural America,” said Blietz in an artist’s statement from September 24, 2018, published on his website, www.blietzstudio.com. Sadly, several factors, including tariffs imposed by the Trump administration and a decline in milk prices, have caused many small family-owned dairy farms in this state and others to shut down. Blietz’s paintings use the cow to symbolize the importance of agriculture in America as a whole and reflect a nostalgia for farms of yesteryear.